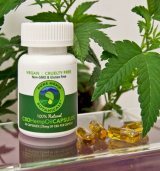 Pure Hemp Botanicals’ CBD Hemp Oil Capsules contain 25mg of CBD (cannabidiol) (about 60% CBD content!) per capsule and are convenient and easy to swallow. These natural hemp oil capsules are made from 100% industrial hemp, organically grown in Colorado. 30 capsules per bottle. Our natural hemp oil contains high grade CBD, delivering 25mg of CBD per capsule (about 60% CBD content!). Our third party lab ensures that each capsule contains less than 0.3% THC, so you can rest assured that our products are non-psychoactive. Derived from 100% industrial hemp, our products come from the whole plant, pure and simple. Inactive ingredients include vegetable capsules and coconut oil. This non-GMO, vegan product is gluten free and cruelty free. Anxiety reduction Helped me feel much calmer. I would highly recommend these pills. These are the real deal I've tried other products but they were weak. The CBD content in this stuff is pretty high. I can actually feel a difference when I take these! They make a huge difference. I'm getting relief from pain and inflammation in my back. I feel sooo relaxed when I take them and I sleep soundly and deep sleep all night long.